If you’ve never had Baked Falafels – you’re really missing out on a treat. Crispy, crunchy, little patties of Spicy Chickpeas smothered in a tangy Cucumber Sauce. Ah….street food never tasted so good! Yep, Falafels are a popular Middle Eastern street food. While we have Hot Dogs, Tacos, and Pizza…..they have Falafels. And Falafels are definitely the better choice……much better. Not just because they’re Vegan (which they are), but because if you bake them at home…they are virtually oil free. Better for your waistline and MUCH better for your heart. 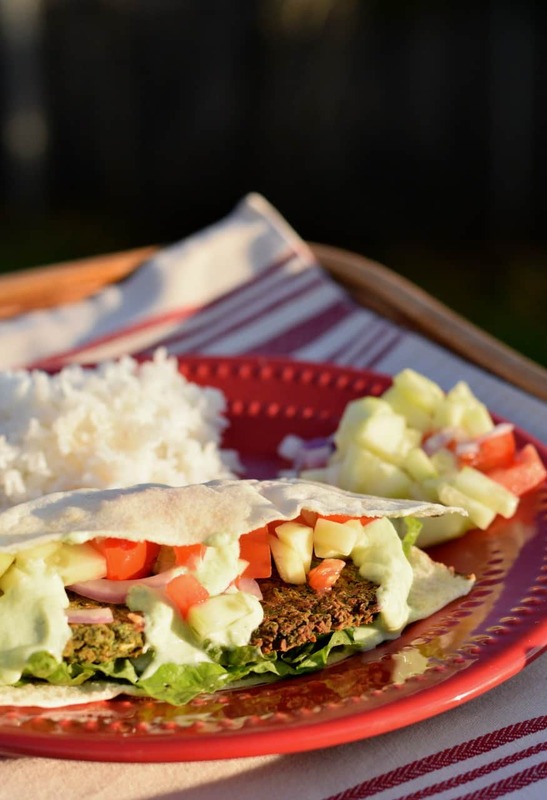 All you need is some Chickpeas, some Pitas to wrap them in, and some fresh Veggies and you can easily make these tasty little treats at home. Yum….move over Hummus – Falafels are here! If this recipe looks ridiculously easy – that’s because IT IS. All you need is basically a Blender and a Food Processor. The sauce literally comes together in minutes, and there’s hardly any prep for the Falafels. The most work you’ll do making this meal is chopping your salad veggies for the filling. First let’s make our Tzatziki sauce…..
Cut a 14oz block of Firm Tofu into cubes and add them to your blender. Blend on high until it’s smooth and creamy – adjust seasoning to your taste. Drain and rinse a 15oz can of Chickpeas and add them to your Food Processor. Add all the remaining ingredients and pulse until a course meal is formed. Using your hands, form the mixture into 6 to 8 round balls and slightly flatten them into patties. Place on a parchment lined baking sheet and bake for 25 min at 400º F. To get a nice crispy coating – broil for an additional 10 minutes (5 minutes for each side). Simply stuff your pitas with 1-2 Falafels each, your choice of salad fixings. I recommend Leaf Lettuce, sliced Cucumber, Tomato, and sliced Red Onion. Yum it’s like a Salad Sandwich ! Drizzle with your Homemade Tzatziki sauce and enjoy! 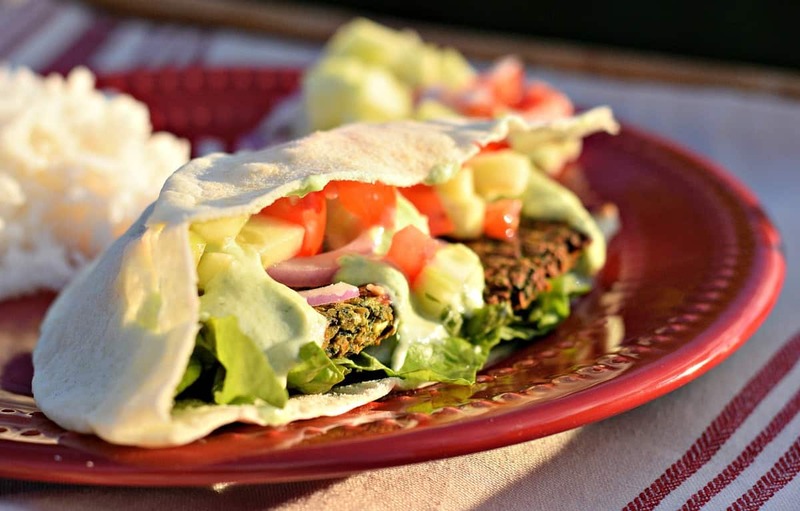 Simply stuff 1 or 2 Falafels in a Pita and serve with your favorite Salad Fixings (Lettuce, Onion, Cucumber, Tomato). Don't forget the Sauce! 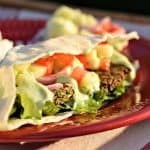 Hi, first, thank you for publishing all of these great recipes! Second, I am hoping to make these today or tomorrow but I don’t have any spinach, however, I do have kale. Do you think it would be an acceptable substitute if I chopped it fine? I’d sure give it a try….. Kale can be a bit stronger tasting so be careful, but yeah I’d try it. Peel the cucumber? I’m going to assume that these can be made in advance and also that they freeze well. Let me know if I’m wrong about that! Never tried to freeze them…..let me know if you do!